The University of Maine at Presque Isle is pleased to present Bunny McBride—the award-winning author of four books, the co-author of the world’s leading cultural anthropology textbook, and President of the Women’s World Summit Foundation based in Geneva—as the next speaker in its 2012-2013 Distinguished Lecturer Series. McBride will deliver her talk Passages & Portages: Reflections on Writing about Women across Cultures on Thursday, April 18, at 7 p.m., in the Campus Center. Her presentation is free and open to the public. During her talk, McBride will reflect on recurrent themes she has explored through the lives of women around the world, with a special focus on Wabanakis in Maine—such as work and motherhood, love and loss, strength and resilience. Women from many cultural niches have shared their stories with her, and she with readers—making connections and marking out bridges of common humanity through their words and hers, woven together on the pages of books, articles, and essays. McBride is an award winning author and veteran traveler. 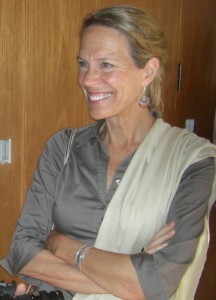 She has written for international newspapers and magazines about Chinese people in the aftermath of the communist Cultural Revolution, Tuareg camel nomads in the Sahara, threatened gorillas in Rwanda and lemurs in Madagascar, Sami reindeer herders in arctic Scandinavia, Maasai cattle herders in East Africa, and Mi’kmaq and Maliseet basketmakers in Aroostook County. With a Master’s degree in anthropology from Columbia University, she has taught at various institutions, and is currently an adjunct lecturer of anthropology at Kansas State University. She serves as board member and President of the Women’s World Summit Foundation based in Geneva. McBride’s books include Women of the Dawn; Molly Spotted Elk: A Penobscot in Paris; Our Lives in Our Hands: Micmac Indian Basketmakers; and most recently Indians in Eden. For National Park Service, she co-authored Asticou’s Island Domain, a two-volume study covering 500 years of Wabanaki life along the Maine coast. She has guest curated several major exhibits for the Abbe Museum based on her books, as well as one on the Rockefeller American Indian Art Collection. Her last exhibition, “Indians & Rusticators” won an award from the American Association for State and Local History—the most prestigious recognition in the preservation and interpretation of state and local history. Working on a range of issues and projects with Maine tribes since 1981—including the Aroostook Band of Micmacs’ federal recognition effort—McBride received a special commendation from the Maine State Legislature for her research and writing on the history of Wabanaki women. Boston Globe Sunday Magazine featured a long profile about her work, and Maine Public Television made a documentary about her research and writing on Molly Spotted Elk. Beyond writing linked to Maine, McBride is co-author of The National Audubon Society Field Guide to African Wildlife and the world’s leading cultural anthropology textbook, Cultural Anthropology, the Human Challenge, translated into Chinese and several other languages. She also has chapters in a dozen books. Her next book, From Indian Island to Omaha Beach: Charles Norman Shay, A Penobscot Indian War Hero (co-authored with her husband Harald Prins), is due to be published with University of Nebraska Press in 2014. For more information about this Distinguished Lecture, please contact the University’s Community and Media Relations Office at 768-9452 or email g.shaw@maine.edu.